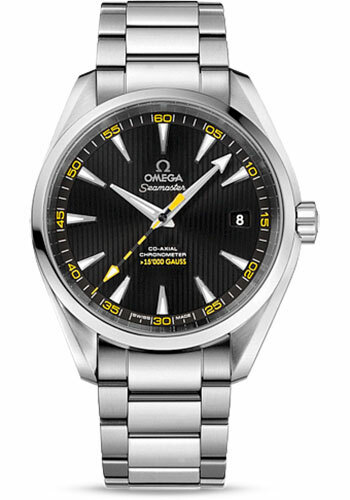 41.5 mm stainless steel case , the world's first completely anti-magnetic timepiece, transparent back, domed scratch-resistant sapphire crystal with anti-reflective treatment on both sides, slightly yellow lacquered black dial with date window at 3 o'clock and a black and yellow seconds hand which matches the yellow numerals on the minute track, anti-magnetic self-winding chronometer Omega 8508 movement with Co-Axial Escapement, date, and seconds, >15'000 GAUSS engraved in red varnish on rotor, approximately 60 hours of power reserve, stainless steel bracelet. Water resistant to 150 m.
41.5 mm stainless steel case , the world's first completely anti-magnetic timepiece, transparent back, domed scratch-resistant sapphire crystal with anti-reflective treatment on both sides, slightly yellow lacquered black dial with date window at 3 o'clock and a black and yellow seconds hand which matches the yellow numerals on the minute track, anti-magnetic self-winding chronometer Omega 8508 movement with Co-Axial Escapement, date, and seconds, >15'000 GAUSS engraved in red varnish on rotor, approximately 60 hours of power reserve, brown leather strap. Water resistant to 150 m.